Here is my share. I did not find much info about ringtone composing on the net, but I read several times that the frequency range of the smartphone speaker begins at 300hz. However I recorded the output of my Samsung Galaxy S8+ with my Shure SM57 microphone and the frequency range starts at 60hz. Maybe old info on the net. So I got an EQ plug-in with 4 low cut filters on my bus, filtering all frequencies below 60hz away. In case you are wondering how your ringtones will sound on an actual smartphone. I discovered the following plug-in’s that emulate the sound of a smartphone/small speaker: Audified Mixchecker (Pro), Toneboosters Isone (Laptop preset) and Audio Ease Speakerphone. I only tried Isone. I make free ringtones and message tones for Zedge, one of the largest providers of free ringtones. All ringtones must be 29 seconds or shorter. In the beginning I made the mistake to upload my material in the mp3 format, thinking that they would only offer a mp3 file. At Zedge they have their own converter, so you better use a lossless wave file for a better conversion quality to the different audio formats for smartphones. Some material, chromatic percussion for example, can sound too harsh on a smartphone speaker. My efforts in trying to solve this with (precision) EQ often were not successful. However I got better results to soften the sounds with Softube Tape, a tape effect emulation. Re: Any ringtone composers here? However I recorded the output of my Samsung Galaxy S8+ with my Shure SM57 microphone and the frequency range starts at 60hz. Maybe that's only your model - in general smartphones are getting better over time. However, if you listen to any random song on a random phone laying on the table, it will clearly have no bass. You can't assume everybody has high-end smartphone with powerful speakers. Unless you recorded your phone on a pillar of foam in an anechoic chamber, it was probably room modes and mechanical vibrations you picked up. Nicer smartphones use basically a simple contact mic wiped as a speaker to vibrate the phone at lower frequencies. This will vibrate the room to some extent and and anything the phone is touching, giving the impression of an extended bass range. They also license bass enhancement DSP from companies like waves and JBL to give a psychoacoustic impression of the bass frequencies that the speaker can’t recreate. The trick is mixing the low end very tightly. Then you will generally want the lowest two octaves to be run through a nice nonlinear processor to generate some nice higher harmonics that will give the implication that the bass is still there. The mix and master can be exactly the same as it would be for any playback system. The bass will come through even in the sub region provided you have strong harmonics up above a couple hundred heartz. The other thing that needs more attention in tiny/ tiny playback system is your transients. Making sure things aren’t “peaky” down in the bass octaves will keep things from getting muddy and allow for the levels to be pushed without unwanted distortion. I use a combo of the Melda multiband transient, and the built in cubase envelope shaper to keep this part of the spectrum as clean and controlled as possible. Generally speaking though, I wouldn’t worry too much about taking special steps for cellphone playback. Some phones sound very nice and others sound like garbage, but a good mix will still be good on whatever playback system you use. The trick is mixing the low end very tightly. Then you will generally want the lowest two octaves to be run through a nice nonlinear processor to generate some nice higher harmonics that will give the implication that the bass is still there. Thanks for the input. I already use toplayers on my bass drums for the same reason. There’s also a pretty good chance that the “300hz” that you found online is just where the speaker goes outside a tolerance of 1-3 Decibels. Most bode plots of gear and speakers will quote their frequency response between two frequencies where it stays “flat”. These things will still pass signal outside the range quoted, but it will no longer be close to what goes in as far as the level goes. For testing purposes you can capture an IR of your phone (or any number of other phones) and check your mixes through that using one of the many convolvers out there. That’s what Mixchecker and Speakerphone do. I think there are a couple free Deconvolvers out there. Do you make the gold baby libraries? Your stuff is awesome. You should stop leaving the reverb and delay sends upby default on your libraries if so..... sorry to be that guy. It’s a bit of a pain to turn off all the sends you don’t want when you want to add an effect to a single pad. My day to day job is acoustic engineer. I mainly work with mobile phones. I randomly took data from a mobile phone speaker data sheet where you can see how the component manufacturer measure the speaker frequency response. Adding to that the acoustic engineer will tune the frequency response using FIR filters, by software tools provided by the platform manufacturer. Basically a small speaker (typically 11 x 15 mm) can't reproduce very low frequencies in a good way, as you can see from the frequency response in the data sheet. Lowering the mids and highs will basically give the feeling of higher lows, but without actually increasing the low frequencies. Ring signals from the hands free speaker in a phone is of course mono, but normally stereo in the headset. It's worth to keep this in mind when mixing and mastering ring signals. When I created ring signals I always mix in mono because if it sounds okay in mono it normally works fine in stereo. Low frequencies tend to cause distortion because the small speaker can't handle low frequencies very well. I hope you find the information from the data sheet useful. ... For testing purposes you can capture an IR of your phone (or any number of other phones) and check your mixes through that using one of the many convolvers out there. That’s what Mixchecker and Speakerphone do. I think there are a couple free Deconvolvers out there. Will study this option. Don't have experience with this. @ATN69 Thanks for your great input! 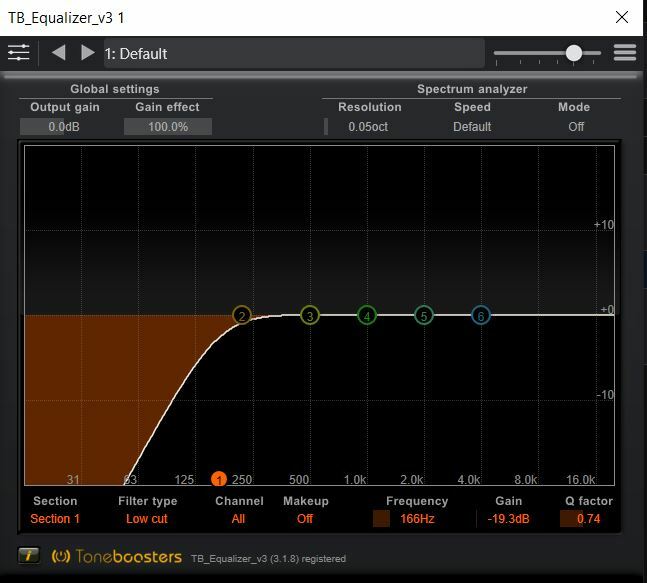 Here is a screenshot of my EQ with a single low cut filter. I got a preset in this plug-in with 4 layers of such low cut filters with this setting. What setting do you guys suggest?